The Port Hedland Information Directory is released at the start of each year. This directory, often referred to as the “bible” of the Hedland area, contains every imaginable type of vital information on our town and region, from comprehensive business listings to tide times to maps to community contacts. Thousands of copies of the Directory are distributed to every household and business in the area. The Information Directory is so integral to the Hedland community that it even has its own dedicated web site: www.porthedlanddirectoryonline.com.au. The online version contains all the same business information as the hard copy, as well as information on the PHCCI and Town of Port Hedland. The Port Hedland Information Directory – both the printed and the online versions – provide comprehensive details of local and surrounding businesses, Council services, local community and sporting associations, town maps, tide charts and a regional calendar of events for the year. The Port Hedland Information Directory is the “must have” book for any business and home, and is usually the first thing people reach for when they’re looking for any kind of business service in Hedland – so if your business isn’t advertising in the Directory yet, you’re missing out! The PHCCI prints more than 10,000 copies of the Port Hedland Information Directory annually, which are distributed to residents, visitors and local businesses. The Port Hedland Information Directory is an evolving process and it is PHCCI’s goal to continue to grow and improve this publication each year. How do I get a copy of the Directory? Copies of the Information Directory are delivered straight to the mailbox of every home and business in Port Hedland, South Hedland, Wedgefield and surrounds, in late December/early January each year, as soon as the upcoming year’s edition is printed and released. All you usually need to do is watch your postbox! 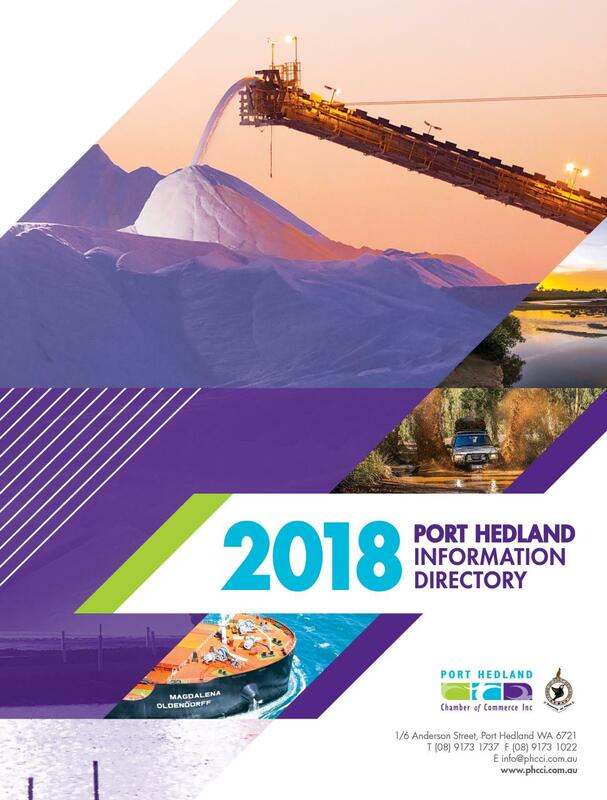 However if you missed out on your own copy of the Port Hedland Information Directory this year, extra copies are available from the PHCCI office, which you can pick up for free. We’re also more than happy to post one out to you anywhere in Australia – all you need to pay is the postage and handling ($10.00 within WA and $12.00 outside WA). Please contact us if you would like to know more about this service. How do I search the Directory online? If you’d like to quickly search the Directory online for a business or residential listing, just use the directory search form over to the right. Alternatively you can visit the Directory’s own website for more advanced search options. Who do I ask about advertising in next year’s Information Directory? If you don’t have an advertising design prepared, no problem – just ask the brilliant design team at Market Creations about your options and they’ll be happy to design an ad for you. Please make sure you allow at least 4 months lead time ahead of the launch of the next edition, in order to get your advertisements submitted and finalised in time for printing. We’d hate for you to miss out! Thanks and happy advertising!